The Dues Pie Chart—Where Do My Dues Go? Note from your Master Executive Council (MEC): This information was prepared by AFA International as a resource for Flight Attendants. 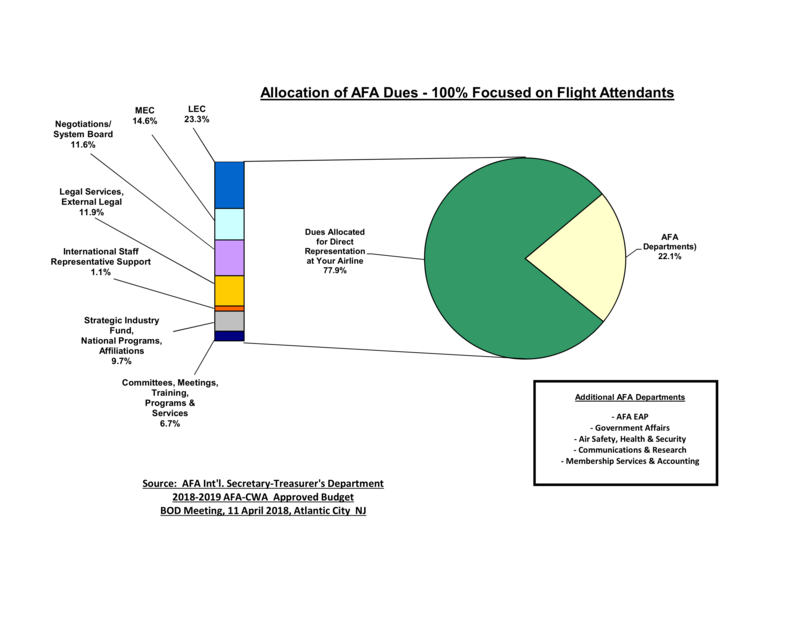 The Dues Pie Chart depicts where all funds at AFA are budgeted. About 80% of dues dollars are directly allocated to fund the work at each airline, i.e. Local Councils, Master Executive Councils, Negotiations, and System Board. The remaining budgets at the International Office support Government Affairs, Air Safety, EAP, and Communications Departments, each of which provides expert services that are Flight Attendant focused and provide resources for the local leaders and committees of Flight Attendants at each airline. 100% of our dues dollars are allocated to priorities that provide Flight Attendant representation. If you have questions about AFA dues, please contact your LEC President. The MEC Chairperson of the Scheduling Committee is responsible for coordinating the activities of the committee at the airline level. The Chairperson works closely with each Local Committee Chairperson to gather feedback and input and represents the positions of the Committee and MEC in interactions with management. (i) The committee will recommend and assist in constructing pairings and building sequences of trips and days off into monthly lines of time. a. The MEC Scheduling Committee shall consist of the MEC Scheduling Committee Chairperson, the MEC Scheduling Committee Vice Chairperson—PBS, the MEC Scheduling Committee Vice Chairperson—Pairing Construction, and the Local Scheduling Committee Chairperson from each council. (ii) Maintain written records of agreed upon standards and procedures and shall report to the MEC any proposed or imposed modifications to such practices. (iii) Monitor the company throughout the scheduling process for any perceived or potential violations of the Agreement and shall identify these violations to the LEC President of the domicile affected. (iv) Comply at all times with the applicable provisions of the current collective bargaining agreement. (i) Monitor monthly staffing reports and make recommendations to the company for appropriate resolution. (ii) Monitor placement of flying and provide the MEC with evaluations of such placement and its justification. (iv) Use domicile feedback to work with the company in resolving the Union’s problems and concerns. (v) Monitor staffing statistics and, where appropriate, establish trends of chronic understaffing for current and future use. Use all information available to eliminate understaffing. (i) The MEC Scheduling Committee in conjunction with the MEC Reserve Committee Chairperson will review placement of flying with the intent of resolving the problems that generate such placement. (ii) Should specific causes be established, the MEC Scheduling Committee shall work with the company to resolve the Union’s concerns provided that such action does not otherwise negatively impact the Flight Attendants, i.e. surplus, or excessively low block time. a. The Scheduling Review Board (“Board”) shall consist of the MEC President (or designee), MEC Scheduling Committee Chairperson (or designee with the concurrence of the MEC), and Director of Inflight Crew Scheduling (or designee). Additional guests may be invited and participate as needed. b. The Board shall meet at least every two weeks to address and resolve disagreements between the union and the company pertaining to any subject relating to Flight Attendant schedules or actions of the Inflight Crew Scheduling Department. c. The Board may meet either in person at a mutually agreed location, by telephone conference call, or by other electronic means of communication. d. Items for inclusion in the agenda shall be provided to all members of the Board at least twenty-four (24) hours in advance of the scheduled meeting to allow time for proper research and preparation. Items submitted within 24 hours of the scheduled meeting will be placed on the agenda of the following meeting, except by mutual agreement. Robust working knowledge of scheduling provisions of the Flight Attendant collective bargaining agreement. Knowledge of CFRs and other regulations pertaining to flight time, duty time, and crew rest guidelines. Strong computer skills. Excellent working knowledge of Jeppesen Crew Access (JCA, NavBlue PBS, Google email, and Microsoft Office. Ability to meet deadlines, delegate responsibilities, and follow up on assigned tasks. Provide assistance and guidance to Local Scheduling Committee Chairpersons in handling scheduling-related concerns and issues. Assist in resolution of issues as needed. Attend meetings with management and represent the AFA position on scheduling-related matters. Participate in the Scheduling Review Board process. Oversee the activities of the PBS and Pairing Construction subcommittees. Schedule, plan, and conduct monthly meetings of the committee and other meetings and conference calls as needed. Coordinate with the MEC Reserve Committee Chairperson to discuss issues that affect both reserve and lineholding Flight Attendants. Correspond with the Local Scheduling Committee Chairpersons and MEC regularly to provide status updates. Prepare and send a monthly committee report to the MEC. This position is budgeted for 100 TFP of Flight Pay Loss (FPL) per month in accordance with section 27.P.2.b of the CBA, paid with a 5% override at “A” pay. Time commitment is approximately four days per week in Seattle with additional work completed remotely or in the office as necessary. No relocation or accommodation expense is provided for this position. The MEC Scheduling Committee Chairperson does not bid a line. Constant interaction with the Local Scheduling Service Committee Chairpersons. Frequent interaction with Local Scheduling Committee Members. This position reports to the Master Executive Council. The MEC executive sponsor for the committee is the MEC President. The MEC will hold interviews during the August MEC meeting on Tuesday, August 29. Interviews will be at the AFA Alaska MEC office in Seattle. Submit a declaration of interest and resume to MEC Secretary-Treasurer Linda Christou at linda.christou@afaalaska.org no later than 5 PM Pacific Time on Friday, August 18, 2017. Linda will be able to provide additional information regarding transportation and booking of flights if necessary. Appointments are effective immediately. Terms of appointment coincide with those of the MEC Officers, concluding on December 31, 2019. If you have any questions about MEC Committee Chairperson appointments, please contact your LEC President. As previously announced on December 9, the Master Executive Council (MEC) will be conducting interviews for the majority of the MEC Committee Chairperson positions in early 2017. As part of the interview process, a series of screening interviews were scheduled to occur on January 4 by videoconference. The purpose of the screening interviews was to narrow each position to two finalist candidates who would be invited to interview with the MEC in person at the February MEC Meeting. Since only a few positions yielded more than two candidates, the MEC has decided to bypass the screening interviews and advance all candidates to an in-person interview at the February MEC Meeting. In accordance with Article VI.C of the AFA Alaska MEC Policy and Procedure Manual, the term of appointment for the MEC Committee Chairpersons is concurrent with those of the MEC Officers. As the current MEC Officer term of office will end on December 31, 2016, the MEC will be conducting a review of the MEC Committee Chairperson positions in early 2017. Appointments for the ASHSC Vice Chairperson, Government Affairs Committee Chairperson, Grievance Committee Chairperson, and Inflight Service Committee Chairperson positions were all made within the last several months. As a result, these positions will not be reviewed and will continue their term until the end of the next MEC Officer election cycle. Strong computer skills. Good working knowledge of Inflight Mobile Device, Google email, and Microsoft Office. Information about the duties and responsibilities of each specific committee can be found in article VII of the MEC Policy and Procedure Manual, which can be accessed by clicking here. Time Commitment and Flight Pay Loss for each position will be discussed during the screening interview. Qualified candidates will be invited to a screening interview with the MEC by video conference on Wednesday, January 4. Finalists will be invited to an in-person interview at the AFA Alaska MEC office in Seattle at regularly scheduled February MEC meeting on February 21 and 22. Submit a declaration of interest and resume to MEC Secretary Treasurer-Elect Linda Christou at linda.christou@afaalaska.org no later than 5 PM Pacific Time on Wednesday, December 28, 2016. Any questions about MEC Committee Chairperson positon duties and responsibilities can be directed to MEC Vice President Brian Palmer at brian.palmer@afaalaska.org.